Intro: Rarity wakes in the morning to the smell of smoke and finds Sweetie Belle cooking breakfast for her. Act 1: Rarity and Sweetie Belle's parents leave the sisters together for a week, and all Sweetie Belle's attempts to help Rarity result in disaster. Rarity loses her patience when Sweetie Belle uses Rarity's gems to decorate a drawing, and Sweetie Belle leaves, calling her an "un-sister." Apple Bloom invites Sweetie Belle to the annual Sisterhooves Social, but Rarity believes the event would be too "uncouth." Act 2: Sweetie Belle mopes around at Sweet Apple Acres, where Applejack and Apple Bloom demonstrate sisterly cooperation. Meanwhile, Rarity stews until she finds Sweetie Belle's drawing, which is of the two sisters together surrounded by a heart. Rarity finds Sweetie Belle camping with the Apples, but Sweetie Belle is still angry. Act 3: Sweetie Belle attends the social with the Apples, and Applejack agrees to "adopt" her as sister for the big race. Sweetie Belle's racing partner is covered with mud from a pit just after the start, and after the race she learns that AJ and Rarity used the pit to switch places. Rarity and Sweetie Belle then reconcile and write Princess Celestia about the need for compromise in relationships. Character: Applejack has been associated with family from the beginning, and so her close relationship with Apple Bloom fits right in, as do their farmwork-related activities. In fact, the Social is evidently put on by the Apple family. But the chemistry/rapport we see between AJ and AB is as charming as it is natural. (Yes, Applejack calls her "AB" at least once here.) We're seeing these characters at their best. The animators also do a great job showing how uncomfortable the Apple sisters are with Sweetie Belle's remarks about her own sister. Sweetie Belle was revealed to be Rarity's sister way back in Stare Master, but we don't see them interact much between that episode and this one. The crucial winning element of this story is the fact that we can understand and empathize with Rarity's side and Sweetie Belle's side at the same time. It's clear they both want to be close, as Rarity repeatedly suppresses her frustration and Sweetie Belle constantly tries to do the right thing. Even once Sweetie Belle has disowned her sister, Rarity's the only pony she can think about. The lengths to which Rarity goes to win back her sister are impressive but are in line with her desire over the course of the story. Rarity shows some character development here as she interacts with Applejack, speaking with admiration rather than the jealousy we might expect and even asking her advice. She's come a long way since Look Before You Sleep. Oh, and as with Lesson Zero, I'm happy to see the CMC (two of them, anyway) just doing friend stuff and not single-mindedly seeking cutie marks all the time. Lesson: Giving vs. giving in is a well stated lesson, nice and pithy. It's a common failing that we tend to love others in ways that are comfortable for us rather than in the ways they recognize. I liked the wording of the letter this time around. There's much to be said for compromise and acceptance of differences, but sometimes the best thing to do is set all your "issues" aside and have fun together. Logic: Scootaloo's absence from the episode and the fact that she remains (to this writing) the only Crusader whose family is unrevealed has fueled much fan speculation. Does she suffer from abuse? Neglect? Is she a homeless orphan who sleeps in the clubhouse at night? I suspect this will be settled on the show sooner or later. Note that Sweetie Belle does not live with Rarity. She's visiting here, and we see her bedroom at her parents' house at the midpoint of One Bad Apple. (They live next to the windmill.) Connections: I like to think of this as Look Before You Sleep done right, since they have the same basic message and the same adult characters. Resonance: There are a few gags here, but this is one of the more serious stories. This show offers a ton of heartwarming, most of it from the Apple sisters; especially notable is the end of the grape treading scene. Rarity asking Applejack's advice is a high point, especially considering their history of conflict and the fact that we've never seen Rarity ask advice from anyone before. The reveal after the race is exceptionally done. 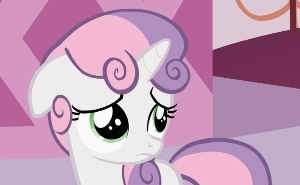 I also found the reveal of Sweetie Belle's picture to be a bit of a tear-jerker, though some viewers think Rarity's melodrama a bit over-the-top. I think it's in character and so I take it as seriously as I do Spock "sobbing mathematically" in the Star Trek episode "The Naked Time." Oh, and Sparkler and Dinky are paired together again in this episode. As for the laughs, we start off with Sweetie Belle's charred breakfast and the fact that their parents totally lack Rarity's sophistication. 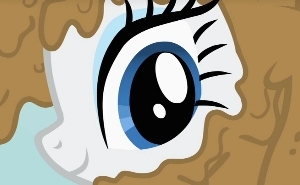 (The idea that her high-brow demeanor is something she consciously adopted for herself deserves serious attention, by the way, from fanfic writers if not from the show itself.) The sheep's "You could've just asked" line is a funny reminder that all hoofed animals are sentient in the world of MLP. Rarity's elaboration on AJ's apple pie metaphor is also hilarious. 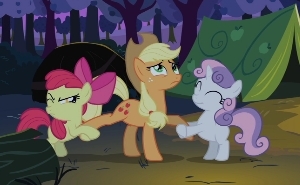 Other Impressions and Final Assessment: The filly walking animation used for Apple Bloom and Sweetie Belle is already cute. (I think it's the stubby legs. Very corgi-esque.) To this we can now add SB's hind-legs-only crawl. 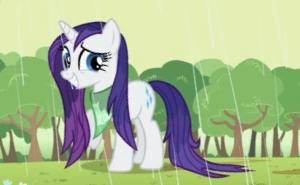 Pacing of the story is quick; there are a lot of short scenes here, with most of the second act intercut between Rarity working through her issues and the antics at the farm. The third act is focused on one location, but the race is a non-stop action sequence. By the end we feel like we've seen a lot but we've had fun along the way. This is another wonderful entry, though not a high-stakes landmark episode. It's one of the best early slice-of-life stories, and I rank it a notch above Green Isn't Your Color.